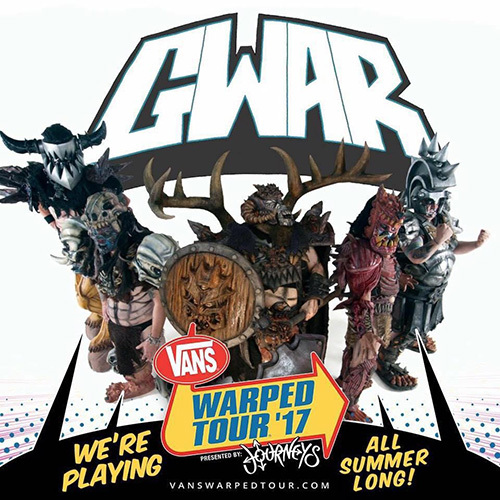 Attention filthy humans: as you already know, your Lords and Masters GWAR will be hitting the road this summer as part of the Vans’ Warped Tour…scratch that…it is now called the Vans’ #GWARpedTour. That’s right, our alien overlords are working on their plans to take over the entire tour, and today they are beginning to put this plan into motion by taking over the #GWARpedTour social media accounts. Rumor has it that the band will be revealing some details about their upcoming album, as well as filling you in on what you can expect this year from the Mighty Scumdog Warriors! “I don’t look forward to much but I gotta say, there’s no other job on Earth where you get paid to spray blood on kids. To make sure we had enough vital fluids for this #GWARped Tour we had to sacrifice the inhabitants of an entire island community!” says guitarist Pustulus Maximus.